This is a new picture of Neptune taken from the Earth. It’s nothing short of amazing. You’ve probably seen better pictures of Neptune from when Voyager 2 flew by in 1989. 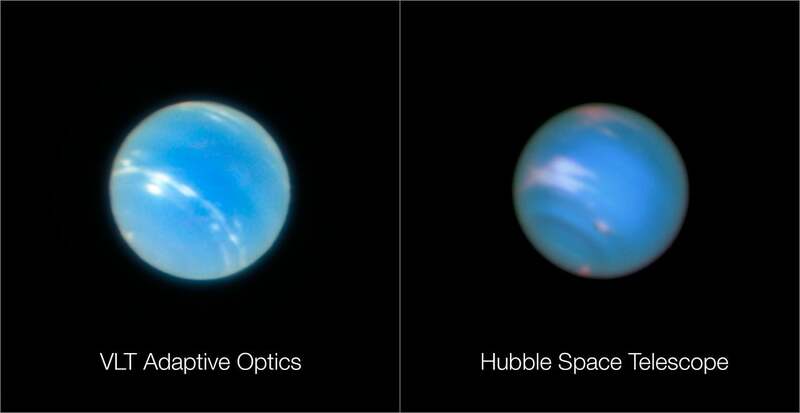 But there isn’t currently a spacecraft orbiting Neptune, so if scientists want pictures, they need to take them from 2.9 billion miles away. An upgrade on the Very Large Telescope at the European Southern Observatory in Chile has now allowed the ground-based telescope to take images as crisp as those taken by Hubble, a telescope that orbits Earth. The Very Large Telescope consists of four telescopes with 8.2-metre (27-foot) mirrors in northern Chile’s Atacama Desert. Yesterday, scientists at the observatory released the first observations taken with laser tomography, the new adaptive optics mode on its GALACSI unit, which works alongside a spectrograph instrument called MUSE on one of the telescopes. Essentially, the Earth’s atmosphere distorts the appearance of things in space, causing stars to twinkle and blurring distant objects. If you want to observe from the ground, you have to find a way to correct for the blur, and if you want to know how much blur to correct for, you need to a reference point. The VLT has a facility with that shines four bright lasers into space, creating a fake star in the night sky. It then uses the blur on the laser to inform a computer-controlled mirror that constantly changes shape. This corrects for the atmosphere’s effects so that MUSE can take a crisper picture. It makes a clear difference. 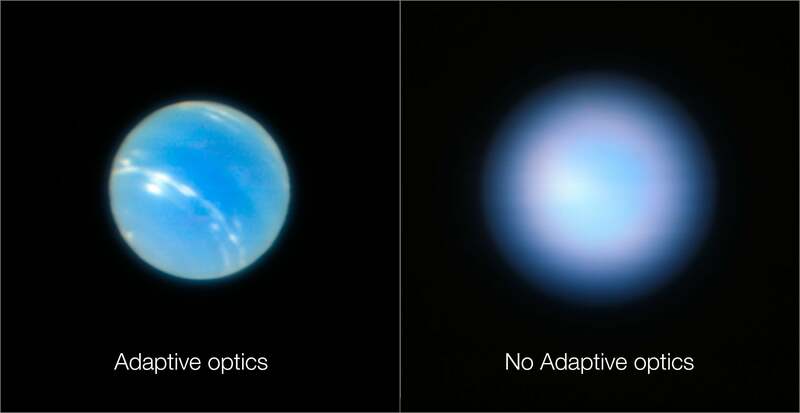 There are two adaptive optics modes—narrow-field mode, which can image small points of the sky with high precision, and wide-field mode, which can image larger parts of the sky but only correct for a kilometre-thick swath of atmosphere distortion, according to an ESO press release.